Short (Long) 48 (88)cm / 19 (35)"
This pattern is part of The Tea Collection. A collection of hats and cowls celebrating tea from around the world. Patterns will be added to this collection throughout 2015. For more details check out The Tea Collection ebook. 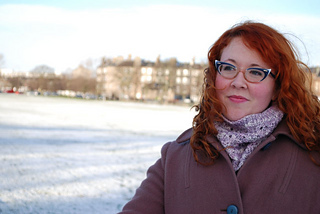 Sumptuous, soft Baby Alpaca envelops your neck, keeping you warm and stylish on the coldest days. 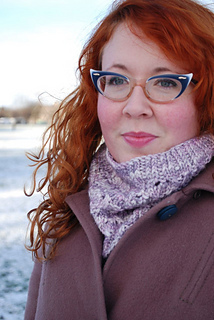 The stitch pattern is truly reversible, giving you two elegant cowl options in one. The easy-to-remember eyelet pattern knits up quickly. Available in two sizes. 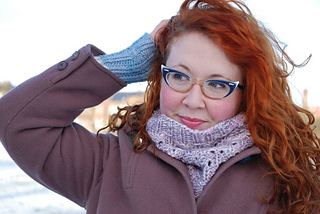 Choose a bouncier yarn like Ginger’s Hand Dyed Flumps Chunky for a more pronounced stitch detail in the lace pattern. 15 sts and 20 rows to 10cm / 4” in pattern worked in the round, blocked. 16 sts and 26 rows to 10cm / 4” in 2 x 1 twisted rib worked in the round, blocked. Gauge is not crucial; however, changes will affect finished size and yardage requirements. 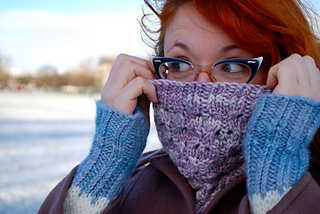 Both cowls use almost the entire yardage. 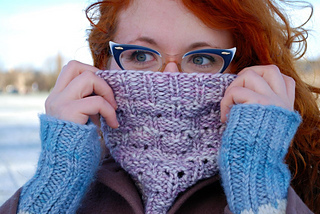 If your gauge varies from the recommended pattern gauge, please make sure you have extra yarn available.